A self-powered 48 V Meyer Sound loudspeaker system has been installed in the south concourse of the new Terminal B at Houston’s George Bush Intercontinental Airport (IAH.) Despite large reflective surfaces and tall ceilings, announcements and music are projected with a crisp clarity difficult to achieve in transportation facilities. Both airport management and the concourse operator, United Airlines, worked to offer across-the-board improvements in traveler experience. 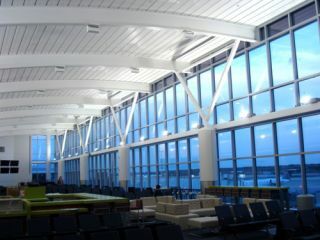 Improving audio quality in the concourse proved a challenge, as the 27-foot high ceiling, the room’s large size, and the expansive glass area presented acoustical difficulties. To control unwanted reverberations, Houston-based HFP Acoustical Consultants designed both the room’s acoustical treatments and the Meyer Sound self-powered loudspeaker installation as a balanced, integral system. The principal Meyer Sound system comprises 60 UPM-1XP 48 V loudspeakers, 44 MM-4XP self-powered loudspeakers, and two Stella-4C installation loudspeakers, with a Galileo loudspeaker management system with seven Galileo 408 processors providing system optimization. LD Systems of Houston installed the system.